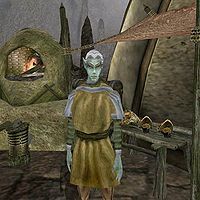 Dandera Selaro is a Dunmer smith who has a stall outside of her house in Ald'ruhn. She offers repairs, and a selection of mostly armor and a few weapons for sale. If you have installed the LeFemm Armor official plugin, she will have a set of Domina Armor for sale. Also, if you have the Adamantium Armor plugin, she will have some of that as well.